Shoshone Falls is considered one of the most beautiful on our planet. Shoshone offers a magnificent view, which is formed along the Snake River, which flows through the northwestern part of the United States. Snake is the left and largest tributary of the Columbia River, with a total length of 1670 km. Shoshone Falls itself was formed about 8 km east of Twin Falls, in the U.S. state of Idaho. The strange name of this beautiful natural phenomenon, is due to the Indian tribe of Shoshone, who inhabited these lands 12, 000 years ago. Shoshone is actually a collection of several fountains, which today are considered a symbol of the country. Not surprisingly, Shoshone is called the "Niagara of the West", because of its impressive size and beauty. Water flows in from a height of 64.7 m, which makes it 10.97 meters higher than Niagara Falls. The width of the crest water Shoshone reaches 274 meters. It is believed that this natural formation was formed somewhere between 30, 000 to 60, 000 years ago. 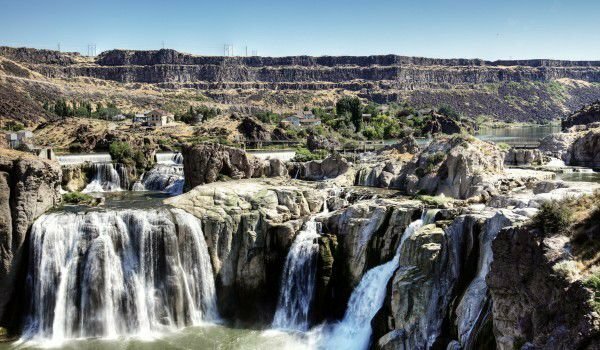 Today, Shoshone Falls is owned by the city of Twin Falls, dealing with the management and coordination of tourists visiting the Falls. It is recommended that tourists visit Shoshone in the spring months, because during the summer and fall, the size of Snake River weans, due to the needs of irrigation for the agricultural areas. Only in spring this does not happen and the power of the Shoshone can be seen in all its glory. The first to see the magnificent view of the Shoshone was Trapper John Coulter, who first set foot on these lands in 1807. Coulter met with this unprecedented beautiful corner of nature and it led him to describe the wide waterfall in detail. His descriptions evoked interest among his countrymen, and from there onwards more and more people begun to explore those considered previously inaccessible lands. This leads to the retreat of the Indians from the region of the Shoshone. The first tourists who come specifically to see the waterfall, arrived here thanks to the railroad, built in the 1920s. The management of the Twin Falls area has made the Shoshone into a well developed tourist destination. There are a wide range of recreational facilities, including playgrounds and walking trails, landscaped picnic areas, a swimming area and an area for boats, as well as several scenic sites. Annually about 3 million tourists visit the park and the waterfall. Shoshone’s complex has toilets and parking for cars with minimal fees. Here visitors can enjoy a nice picnic and relax under the shady, grassy areas, which provide a wonderful view of the Shoshone.